The perfect escape for any type of indulgence seeker. A palm tree-lined entrance welcomes visitors to the 360-acre Westin Mission Hills Golf Resort & Spa, a desert oasis near Palm Springs in southern California. The family-friendly resort has a modern Spanish look, with columns edging walkways and lush gardens outside. Inside, guests can choose from among 512 softly hued suites and rooms. Within the facility is The Spa at Westin Mission Hills, which offers massages based on techniques from around the world and other skin-care services. Outside are three swimming pools--including one with a 60 ft. waterslide. Two championship 18-hole golf courses are available to guests, and seven tennis courts are set in the grassy grounds. A variety of indoor and outdoor dining options serve up Italian, casual, and seasonal fare. For visitors looking for enrichment, cooking courses and meditation sessions are offered. Several ballrooms and meeting rooms are on the property for weddings, business meetings, and other events. 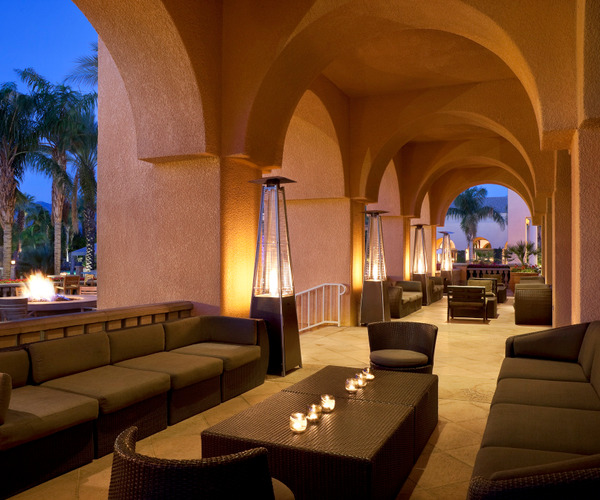 The spacious and airy Spanish-style Spa at The Westin Mission Hills Golf Resort & Spa features 14,000 square feet of tranquility. Dozens of treatments are offered, including massages with origins from around the world, facials, body scrubs, skin treatments, and salon services. Many guests request the spa's signature treatment, the lomilomi: a Polynesian massage that increases circulation. In addition to 14 treatment rooms named after desert plants, the spa facilities include steam rooms, a Jacuzzi and a hydrotherapy room. A handful of activities are offered through the spa, too, including yoga classes, group fitness classes, personal training, and weightlifting. This desert retreat has a host of outdoor options for the active visitor. Two championship golf courses are available, each with 18 challenging holes and stunning fairways. For a break from the heat, many guests are drawn to the three swimming pools. Seven tennis courts are on the property, and players of all levels are invited to enroll in tennis lessons. Off-site, several museums, casinos, shopping centers, botanical gardens, and the Water Park offer numerous diversions. For children, the Westin Kids Club Discovery Room offers arts and crafts, games, supervised playground visits, and sports. Adults can enroll in one of the resort's cooking classes, meditation sessions, or other self-enrichment programs, or listen to a nightly storytelling session of Native American tales. Several meeting rooms, ballrooms, and conference facilities are available throughout the property, as well as an onsite catering staff. Reception spaces can be booked indoors and out. Each of the 512 oversize rooms has a private patio with a view of the grounds, the pools, or the nearby mountains. Set in two-level buildings fronted by fountains, they contain ecru fabrics and mahogany furnishings. Standard guest rooms offer dual showerheads and double vanities in the bathrooms, as well as high-speed Internet access and a data port line. Three types of suites are available, including the two Chairman suites, which come with a fireplace, a piano in the living room, three terraces, and three bathrooms. For dining, guests needn't leave the resort. Casual outdoor meals and snacks are offered at the outdoor Las Brisas Café and Caliente Bar, located near one of the sparkling swimming pools. Pinzimini Restaurant provides a romantic setting for diners who enjoy modern Italian cuisine. At Seasons Grill, the menu draws from the freshest ingredients available, and cooking classes and wine tastings are also offered.